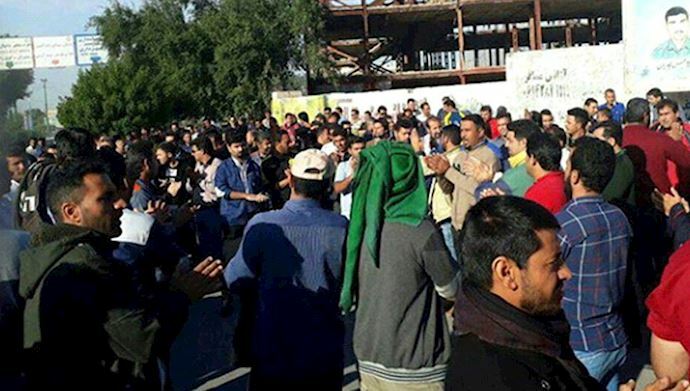 The Haft-Tappeh Sugarcane workers continue their strike against the regime repressive measures and empty promises. 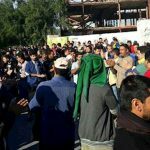 Thursday was an active day for the striking Haft Tappeh factory workers. The regime attempted to halt the protests by sending an IRGC official and a member of the regime’s parliament to address the striking workers and attempt to negotiate with the protesters. The officials were accompanied by Basij forces. The regime officials promised to meet the workers’ demands if they called off the strikes. The striking workers were not impressed by the officials’ promises, which have gone unfulfilled before, and interrupted their speeches with chants. Also on Thursday, security forces raided the home of Ali Nejati and arrested him. Nejati, former president of the Haft Tappeh sugar cane workers union, suffers from heart disease and is currently ill. Upon his arrest, Nejati was badly beaten by security forces. He has since been transferred to an unknown location. The Haft Tappeh factory workers began their strike to protest unpaid wages and the privatization of their company. Workers at the company have not received their salary in several months and have been deprived of basic rights and benefits that are guaranteed under Iranian labor laws. Haft Tappeh is the largest sugar factory in Iran and supplies thousands of jobs to the people of Khuzestan. The factory was government-owned until the regime allowed it to be privatized in a controversial 2015 deal. Since then, employees say working conditions have deteriorated and the factory’s poor leadership has brought it to the verge of bankruptcy. The striking workers want the owners to be removed and their salaries paid. The MEK and the Iranian Opposition has called upon the United Nations High Commissioner for Human Rights to intervene and demand the release of Ali Nejati and other workers who have been arrested by the Iranian regime. Mrs. Maryam Rajavi, President-elect of the National Council of Resistance of Iran (NCRI), has called upon on all human rights organizations to stand in solidarity with the workers of the Haft Tappeh sugar factory and to take action to secure the release of imprisoned Iranian workers.